Running a small business is no easy feat. That’s why we’ve created a forum for small business ideas, insider tips, and the industry knowledge you need to help your small business grow. Don’t wait until mid-year to check in on your financial goals. Steve Strauss shares tips and tools to easily manage your cash flow. Awesome, so glad you got value!! Hi my name is Sergovia i am a naturalized citizen from Russia in the United States Of America 1 year ago. I want to start a store in Upstate new york that sells items that we buy from pallets plus containers for cheap prices because the area I will start it in is economically depressed plus a distance away from any major stores which is hard for people to get to. I plan to register my business as an LLC or an S corp. I will have no partners I will only have part time employees who will run the store while I am gone when I can not be there. Is there any insurance that will cover my products plus my store if it is robbed or stolen from? I have researched it before but it seems like the insurance companies only want to work with big stores or companies I am only looking for 50,000 to 100,000 dollars in coverage. I have also read that you need a security system on your store would I also need video cameras or is this optional? Is there any trusted insurance companies who I can make sure they will actually pay the insurance claim instead of refusing it and running off with all of the money I payed them? I understand there is deductibles which is fine with me but is it like life insurance where I will have to go a certain amount of time without getting robbed or stolen from where I will have to have security guards at my store, or after my first payment to the insurance company will my insurance compensate me if I am robbed or stolen from? If you are currently working as a self-employed individual or as a freelancer, then there is a 100% chance for you to get a 1099 form. It is necessary for a company, that is hiring you to report tax information. This includes an accurate information about how much a company has paid you during a specific period of time (one tax year). There is a widely used W-2, that has to be completed by all the employees of the company. 1099 form is an alternative one for those, who work as non-employees. 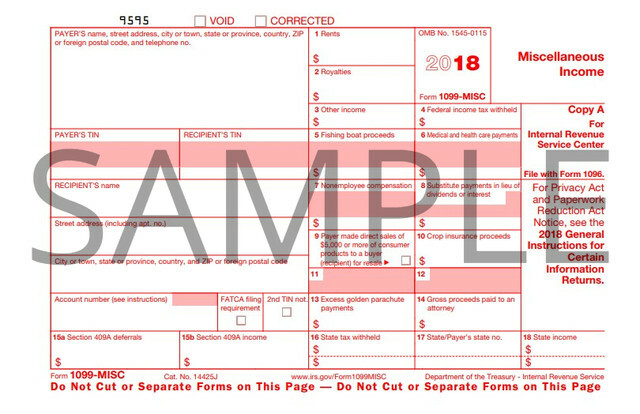 Why should I fill out a 1099 form? Internal Revenue Service requires to complete 1099 form those, who collaborate with the companies as an independent contractor or perform specific services for an organization rather than being a constant employee. This means, as independent worker you are able to control what you are working on and how it may be done. An organization. you work with may only monitor or check the result of the work you have performed. This document works, for example, for drivers, who work for a ride sharing companies, for graphic designers, landscapers, social media consultants, etc. How to report taxes with a 1099 form? So, according to the information mentioned above, while working independently you may receive at least one 1099 once a year. IRS requires United States organizations to distribute this document among their independent contractors no later than on January 31st. There should be indicated information regarding the income paid to each worker over the prior year. It is very important to know, that in case an organization paid an independent worker less than $600 over the course of the year, they don’t have to send a 1099, but a freelancer still has to report his or her income. How I pay taxes with a 1099 form? Any institution has to pay a percentage of their employees’ salaries for taxes. That’s why they may withhold an amount from the payments and wages. In case you work independently, you have to pay these taxes fully. However, if you owe IRS $1,000 or more for the current tax year, you may have an ability to send the required payments quarterly. To divide the paying process, assess your tax liability using as a basis the most recent quarter. For this purpose find a 1040-ES. How to complete a 1099 form? mark the box “2nd TIN not.” in case, you have provided an incorrect tax identification number during the last three years. It is necessary to inform IRS, that now you provide true and accurate data and they don’t need to send you another one notification. It’s been more than a year that you started your business. It’s doing well so far, but now you feel that it’s time to go online. You know that reaching your audience is important and taking your business online can help you do so in lesser time and investment. Thinking of it like that, you finally build your website. But even after a month or so, you do not see much traffic on it. You are worried and confused as to why aren’t you getting to see leads for your business. And now you feel stuck with one question in your head, “what to do next?”. Sounds similar? Well, this is something that can happen to a lot of newbies. But worry not, this can happen to anyone, even those who’ve been in the market for a decade. Lead generation has been a challenge for many, but only a few have overcome this hurdle effortlessly. That’s because they have understood that no matter how many people visit your website, they cannot be stopped from leaving your website until the right live chat software is not in place. Now, you may wonder how does live chat achieve so much during real-time communication! Well, a good live chat software solution will include a lot of features that help your operators build a delightful experience for customers in real-time. Let’s see how live chat for lead generation actually works! Where are they from And so on. Without getting access to this information in real-time, it can be difficult for your business to actually convince visitors to stay and convert into customers. But with live chat, you not only get access to such information but also use it to start a conversation with a visitor in strategic moments. How this feature helps in lead generation: real-time visitor tracking allows you to understand behavior and expect what questions can visitors come up with. With the right live chat in place, you can retain these leads and convert them into customers. Chat routing allows you to distribute workload for all your operators. With this feature in place, you can help support operators maintain quality throughout their conversation that will keep your customers delighted. All you have to do is apply simple rules that will help you assign chats to support team members automatically, thus assisting you to reduce response time hassle-free. 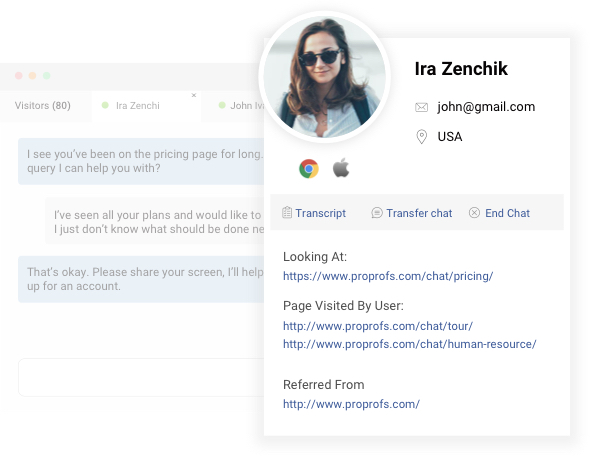 How this feature helps in lead generation: Chat routing can help visitors automatically get connected to dedicated account managers who can provide instant response. This helps you to free up the bandwidth for your support team members who can reach out to other leads and convert them to customers. How this feature helps in lead generation: Chat greetings helps you to increase leads up to30%. That happens when you have the ability to proactively connect with your visitors before they reach out to you, which helps you to increase conversions, and speed up your customer acquisition process. Pre-chat form: Before a chat is initiated, you can gather visitor information and learn which leads can become potential buyers for your brand. Post-chat form: To nurture leads and convert them into buyers, it is important to know how was their experience with your brand. On this basis, when you approach them in the future, you can build a personalized experience that compels them to return to your business every time. CRM integration: It is always ideal to integrate your live chat software with powerful CRM tools like MS Dynamics and SugarCRM. Such integrations allow you to keep a track of your leads and understand their purchasing patterns hassle-free. This integration can also help you store chat transcripts that can be used as references later when the same lead visits your website. Over the years, live chat has become an essential tool to gather leads for a business. However, its potential as a lead generation tool is yet to be discovered among industry players. The use of live chat has become prominent in eCommerce, customer support, healthcare, automotive, IT enterprises and other industries. But some industries are yet to discover its use not just as a lead generation tool, but also as a support software. In case, you’d like to suggest some other features of live chat that can help businesses improve lead generation, then do leave a comment below. Hello! I'd like to ask if I can get a 1000 loan with a bad credit history. Please give me any tip if you have a credential. Thanks. Health is wealth. This a common line we all have heard since our childhood. This line has proved to be true throughout history. Health ensures the quality of life. You can enjoy all the blessings of life and live to your full potential only when you have health. Your body consists of mind, body parts, and internal organs. In order to keep them healthy, follow our tips. Water is essential for living. But it is also important for keeping our body clean from toxins. It is advised to drink eight glasses of water daily. It cleans your liver and digestive system, thus keep your organs healthy. You can see a huge difference in your skin, and bodily performance, once you start to maintain water levels in your body. Don't hold yourself from using a toilet for longer periods of time. Discharging the unwanted materials from the body is really important. Not using toilets on time is one of the biggest reasons for illness regarding, stomach, intestines, liver, and colon. Especially before sleeping, make sure that you empty your stomach of toxins. The walk is really important if life. Make sure that you do at least 30 minutes of continuous walk daily. Go for an evening walk or morning walk. If you have a busy schedule still incorporate it in small intervals, whenever you can. But make this your habit. Even if you do it for 15 minutes try to exercise at least for 15 minutes daily. You can simply incorporate stretches in your routine. It increases flexibility and adds strength to the body. It keeps you energetic and fresh throughout the day and in the long run, improves quality of life. Don’t think of finding someone to write my paper on healthy habits, but do it yourself. Feel free to take help from our article. When it comes to cash flow, the faster you collect payments, the better. Money owed to your company is money not available. So it’s a good idea to assess and refine your accounting procedures to be as efficient and consistent as possible. As you strive to manage receivables more efficiently and consistently, taking the right approach can help you maintain and even nurture your customer relationships. Invoice immediately. Don’t wait until the end of the month or some arbitrary date. Send the bill as soon as the job, service or delivery is done. Send recurring invoices more frequently. If you’re billing in hourly allotments, do it twice or three times a month instead of just once so that money is always coming in. Your invoices should present all the elements necessary for fast payment — including a due date, details of goods or services purchased, order number and payment options (such as credit, debit and mobile wallet). The longer an invoice is out, the less chance it will get paid. Establish a “net 30” schedule. This requires that customers pay within 30 days of the date of the invoice, which can add stability to your account management. Reward those who pay early, such as a 2% discount when paid within 10 days. This might cost a bit up front, but may provide benefits over time with improved cash flow, easier collections and customer satisfaction. Be clear with customers in advance that there may be fees for late payment. But remain open to negotiating a late fee waiver when warranted. Collect partial payment up front. For bigger or long-term projects, break up payments into smaller amounts along the way. Two often-used strategies are collecting half upfront and half upon completion, or dividing into thirds so you get payment upfront, midway and at the end of the project. Set aside a few hours a week to send out invoices and follow up on outstanding invoices. Maintain an easy-to-reference record of customer purchases, contacts and communications. Give a key employee access. A staffer helping with receivables will need access to customer financial records. Even on a part-time basis, a person with accounting knowledge can be indispensable. Use accounts receivable management software. Streamline customer correspondence in one place — including history, past actions and searchability. Plan ahead to make accounts receivable a top priority. Getting automatic cash flow projections through Business Advantage 360 can help. When a payment becomes past due, take action. The longer you wait, the less likely it is that you’ll get paid. The day an invoice becomes past due, be sure to follow up. Unpaid invoices should demand your immediate attention. Emails and letters are easy to overlook or ignore. Calling your customers is a more immediate and personal approach. Here are some tactful ways to approach the sensitive issue of delinquent customer payments. Reaching out before taking any legal action — a call, letter or email — might be all it takes. This is the easiest, most affordable way to resolve the debt. Legally, this may be the least stressful and costly way for you and your customer to reach a settlement. A court-appointed representative will hear both sides and resolve the dispute. Use a debt-collection agency or lawyer. If the bill is large enough to offset the cost, either of these might be the most viable option. Write off an uncollected invoice. Come tax time, you can claim it as a bad debt. In addition to cash or check payments, today there are plenty of technologies, tools and resources to manage receivables more effectively. Consider contacting a small business specialist to discuss what would work best for your business. Electronic payments only need to be authorized once and are then automatically deposited into your designated bank account going forward. Automatic and electronic debits are more secure and minimize human risk, mishandling and error. ACH and EFT services deliver payments at a fraction of the cost of paper check processing. Turn a customer check into an EFT. Take relevant information from their check and process a one-time EFT from their bank to yours, while notifying your customer. Because credit cards are an attractive payment method for many customers, you should accept as many types of cards as possible. They may also substantially reduce the risk of non-payment since credit card providers are required to pursue delinquent accounts. Plus, the benefits — such as increased spending, customer convenience and trust — far outweigh the minimal processing fees. A turnkey point-of-sale system makes processing payments — including electronic checks, debit cards, credit cards, gift cards and more — easier than ever. Typically, funds are available by the next business day. Find out what Bank of America Merchant Services can do for your business. Paper receipts are fast becoming obsolete. The preferred method you should consider for offering your customers receipts is through email. Importantly, email receipts are environmentally friendly, low-cost, easier for customer recordkeeping and minimize fraud related to purchasing and returns. Receipts may also be stored in secure online clouds where they are easily accessible. Make payments as easy as possible by responding to your customers’ preferences: Whether through credit card, debit card or direct debit from a bank account, accepting online payments are essential for customer purchases by phone or through any digital device. Get started with a Bank of America Merchant Services eCommerce Payment Gateway. Similar to mobile check deposits for very small businesses, online remote deposit is designed for businesses frequently processing multiple checks directly from their office. Using a computer and a bank-issued scanner and software, check images are transmitted directly to a bank account, expediting the availability of funds. Bank of America Small Business Remote Deposit Online. A business deposit card is a handy, secure tool that enables you to designate one or more employees to make ATM deposits to your business account, but not the ability to withdraw funds or access private account information. Learn more about business deposit cards. For greater integration of receivables into your accounting system, consider using an e-invoicing service. This would allow you to automate your cash-handling process, and includes electronic invoicing, check and invoice scanning, supplier communications and receiving e-payments. An e-invoicing portal also would enable you to check the status of invoices in real time; make faster decisions; enhance forecasting; increase operational opportunities, efficiencies and security; provide quicker access to receivables; and boost visibility across the process to make better, more informed decisions. Handle payments, invoicing and reporting with Viewpost®. Check out this Small Business Bookkeeping, Accounting, & Tax Guide from FitSmallBusiness.com. Bank of America, N.A. provides informational materials for your discussion or review purposes only. Consult your financial, legal and accounting advisors, as neither Bank of America, its affiliates, nor their employees provide legal, accounting and tax advice. Online shopping just keeps growing. Last year, U.S. consumers spent over $513 billion on the Internet, an increase of more than 14 percent compared to 2017, according to figures released in March from the U.S. Department of Commerce. Almost one retail sale in ten now takes place online. Those changing consumer habits are a challenge for small businesses and not just because every seller has to build an ecommerce store. Do-it-yourself website building kits now make designing a retail site the work of no more than a few hours. The challenge for small businesses is that, while more than half a trillion dollars may be changing hands online every year, some 40 percent of those sales take place on just one site. Amazon dominates online retail. The $867 billion company is more than a store. It’s a complete retail center serving over 150 million unique visitors each month. Its own sales make up much of that retail space but through its Amazon Marketplace feature, Amazon also hosts the online outlets of around six million other sellers. They’re said to make up more than double the value of Amazon’s own sales. Essentially, Amazon is the world’s biggest shopping mall. The challenge of online retail isn’t building the website. It’s finding customers and building enough trust to make them comfortable entering their credit card details. That’s what Amazon’s fees buy. When someone searches for your goods at Amazon.com, your products will appear in their search results. They’ll appear at a place where customers are used to shopping. It’s likely that the customer won’t even notice that they’re buying from a third-party retailer instead of from Amazon itself. For online sellers, Amazon doesn’t have to be a competitor. It can also be a partner, helping you to sell your products to the massive audience that it’s already created. But it’s not quite that simple. Amazon’s benefits come at a cost, and those costs are more than financial. First, the competition is tight. You won’t be the only seller in your space pitching your goods through Amazon Marketplace. To stand out, you’ll need to keep adjusting your prices to keep them competitive. You’ll also need to pick up positive reviews, and, while you can pay for a higher spot in the search results, that expenditure comes on top of your referral fees. Second, you’ll be at the whim of Amazon’s bureaucracy, including a judicial system that has been described as “Kafkaesque.” Amazon is quick to suspend sellers while its appeal process can be difficult and unresponsive. That’s made the marketplace a battleground for dirty dealers whose tricks have included buying fake reviews for competitors, setting competitors’ products alight then telling Amazon they exploded, and reclassifying rivals’ products in the wrong categories. There’s an entire industry of experts and consultants helping businesses with their appeals. Amazon Marketplace can feel more like a Wild West town ruled by a despotic sheriff than the Mall of America. But above all, selling on Amazon Marketplace gives your customers fewer reasons to come to your own website where you have complete control. There are no competitors on your own site. The customer loyalty you win is entirely your own, and you don’t have to deal with Amazon’s strange appeals process. Amazon Marketplace is too big to ignore. But its size and power make it unlikely to be a reliable environment for small sellers. Use it if you believe it will bring you extra sales but make sure that it’s not the only way you reach customers. According to the LinkedIn 2019 business survey, the No. 1 “soft skill” business owners say they want is “creativity.” While this might be true in a survey, it becomes a little more complicated to consider and execute in the real world. Second, there’s a vast distance between “wanting” creativity to flow at a company versus knowing how to guide and encourage the process while protecting customers and the business from any unintended fallout. Set Parameters - The first important detail to point out about creativity is that it’s a condiment, not a meal. It is vital to be clear whereyou want a team to be creative, and within which parts of the process. If you run a bakery, there might be a “lab” part of the business where once a week (or month), you open the kitchen during non-production hours and encourage some recipe exploration. But you would clearly separate that kind of activity from the production tasks required every day. It’s strange to think of parameters as being the first part of building out a creative practice, but it’s also the part most people feel anxiety around. Eliminating potential to harm the business, the customers, or the creative process is very helpful. Have physical space for creativity, including whiteboards, sketchbooks, colorful markers and other materials. Give people the physical tools to explore beyond just words in their head. Share creativity and innovation videos from YouTube like TED talks on design or Disney Imagineer materials. Some people are secretly creative or latent innovators but simply need the right stimulus to get their plans in action. Help your creative people break walls. If you run a car dealership, talk about “What if we sold subscriptions to cars? What would have to change? What if we sold scooters?” And so on. Sometimes, giving people a very different perspective on the business will yield completely new ideas and directions. As a business owner, your role is to keep the operations running, but also nurture a space for new ideas. It’s very challenging to lead people through creative processes. Your role adapts to having to learn how to guide a very fragile experience. Creativity is less hammer and nails and more like dovetailing wooden joints. Reward Creativity (and Failure) - It’s vital that people see their ideas yield future satisfying uses. When you think an idea might be worth a try within your company, celebrate that. It would also empower your people to work more creatively if you celebrated failures. Sometimes, even though an idea fails or can’t be implemented, a key learning can be taken from the experience. Be sure to celebrate and reward both experiences. While people appreciate monetary rewards, be sure that praise and credit go to your creative types. Humans love to feel necessary and wanted. Celebrate failures because if people see there’s not a huge penalty for getting an idea wrong, they’ll be willing to share even more ideas. Innovation is almost always hiding inside a crazy idea, not a safe one. Be sure to keep the cycle of creativity flowing so a reward of being part of the process is that it becomes a facet of an employee’s role. Think of the retention implications of someone saying, “Yes, I install ventilation systems for this HVAC company plus I get to design better internal wiring as part of my job.” That invitation to innovation might hold someone’s interest more than the simple execution of repetitive tasks. Offer some kind of annual creativity-based prize. Be loud about it. Make sure there are videos and an event and lots of internal coverage of the experience. We all love hanging our foil-starred homework on the fridge. Consider adding a failure-based prize to the same experience, but one where you talk loudly about the positive lessons learned from such experiences. In any business, there are people who come up with ideas and people who implement and execute those ideas. It’s the same in most industries. To be the kind of company that has creative ideas and who gets ahead of the competition means making some shifts in how you lead and manage. Creativity is a leadership-heavy activity, not a management-centric one. You have to learn how to collaborate, how to welcome diverse opinions, how to honor different backgrounds and methods and mindsets. Before anything can be “the way we’ve always done it,” someone had to come up with that way. Creativity is the little green buds poking through the soil that eventually yield mighty trees. They require nurturing but what you get will be worth it for sure. Chris Brogan is an author, keynote speaker and business advisor who helps companies update organizational interfaces to better support modern humans. The age of factory-sized interactions is over. We all come one to a pack. And it’s time to accept that we are all a little bit dented. Chris advisesleadership teams to empower team members by sharing actionable insights on talent development. He also works with marketing and communications teams to more effectively reach people who want to be seen and understood before they buy what a company sells. Bank of America, N.A. engages with Chris Brogan to provide informational materials for your discussion or review purposes only. The third parties within articles are used under license from Chris Brogan. Consult your financial, legal and accounting advisors, as neither Bank of America, its affiliates, nor their employees provide legal, accounting and tax advice. Better relationships. Better Business. We’re celebrating Small Business Month. During Small Business Month, we’re focused on helping you make more meaningful connections with your customers and your community. That’s why we’ve pulled together some of our best articles and interviews with fellow entrepreneurs about social media strategy and other topics to help your business. Be sure to check back on this page throughout the month as we add new ideas to improve sales, generate loyalty and build a strong community connection. Do you think it’s impossible for a small retailer to compete against e-commerce giants? It can be tempting to imagine the worst when almost half (49 percent) of all online purchases in the U.S. are made on Amazon, according to a recent survey, and 83 percent of consumers have bought something on Amazon in the past six months. Fear not! There’s still opportunity for independent brick-and-mortar retailers to fight Goliath. Here’s how you can battle the giants and come out on top. Streamline the payment process. Offer a range of payment options, including mobile wallets, so customers can pay in the way they prefer. Shorten wait times. Almost half of consumers alwaysvisit a physical store when they need a product fast. To make it snappy, use mobile devices to process transactions from anywhere in the store. Simplify returns. Clearly state your return policy and train all your employees on how to accept returns so the process goes quickly. Offer click-and-collect. If you have an e-commerce website as well as a store, give customers the option to pick up online orders in the store so they can get them quickly. Use retail loyalty software to gather detailed data about loyalty program members, and marketing automation to deliver timely messages, special offers and shopping suggestions. Share customer data with your salespeople so they can make personalized suggestions or alert shoppers when a particular product is available. Some 79 percentof shoppers say personalized service affects where they buy. Hire employees who genuinely like people and provide training that empowers them to help your customers. Educate your employees about your products so they can explain options, offer suggestions and help customers make decisions. Equip your team with tools they can use to provide a better customer experience, such as inventory management software to show shoppers what’s available. Emphasize your independent spirit. Tell your story in your marketing materials. Why did you start your store? Why are you so passionate about what you sell? What do you love about being an entrepreneur? Encourage customers to shop local. Almost 90 percent of consumers say independent businesses strengthen local economies. Remind customers that supporting your store also means supporting the community through sales taxes and employment. If your community doesn’t have a Shop Local organization, start one. Get involved in your community. Give back by volunteering for local charities and participating in community organizations. Sponsor a local sports team. When people see you care, they’re more likely to buy from you. Create community at your store. Hold in-store events such as book signings, musical performances, or classes for customers. Use social media to build bonds with your real-life community online. Curate your merchandise. Instead of the endless options giant ecommerce sites offer, streamline your selection so customers can choose from the very best. Appeal to the senses. Use sight, sound, smell, and touch to make your store a place where customers enjoy spending time. Keep ’em coming back. Change your store inventory and displays regularly so there’s always something new to discover and shoppers will return more often. Be unique. Almost 40 percent of Amazon shoppers say they’d go elsewhere if a retailer carried unique products. Nearly 86 percent of retail sales still take place in brick-and-mortar locations. Follow these tips, and hopefully, your store will be one of them. Click here to tune into "The Heartbeat of Main Street,” brought to you by ForbesBooks and Bank of America, for episodes covering a range of topics designed to empower and inform small business owners. Start a discussion in our member-to-member forums. By participating in the Small Business Community, our members gain knowledge and connections that give them a competitive advantage in building a successful business. Take advantage of the collective experience and expertise of the community to get help with a specific question or business challenge. To post your question in our community, in the “Ask the community” section, from the drop-down select the category that you’d like to post to, then click the “Start a Discussion” button. If you simply want to introduce yourself to the community, please select the “Introduce Yourself” category. As an Internet pioneer, Joel has been creating profitable websites, software, products and helping entrepreneurs succeed since 1995. He has been at the frontlines of live video online since 2008 and has a deep expertise in using tools such as Facebook Live, Periscope, Instagram or Snapchat to broadcast a clearly defined message to a receptive audience or leveraging the power of webinar and meeting technologies. Joel is a New York Times Best-selling author of 15 books. Small business fraud can be a serious issue for many businesses and prevention of such fraud is a necessity as a modern business owner. You can use these resources to help keep your workplace secure.